—Cumberland, Cape May, Atlantic, coastal Burlington, and coastal Ocean... (Orange)... You already have an inch or two of fresh snow on the ground, and additional light snow/rain will persist through much of Monday. As the storm system surges again Monday evening, a quick transition from snow to rain will happen between about 2 a.m. and 5 a.m. Tuesday. An additional coating to 2 inches of snow is expected here, with little concern for wintry mix and icing due to the speed of the transition. Despite the meager snow totals and mainly wet roads, Tuesday morning's commute may still be a messy ride. —Salem, Gloucester, Camden, inland Burlington, Monmouth, southern Mercer, southern Middlesex... (Purple)... There will be occasional light snow/rain bubbling up from the south during the day Monday, especially south of I-195. As the storm system surges again Monday evening, snow will fall and once again accumulate through Tuesday morning's commute. The transition from snow to wintry mix to rain should occur between 5 a.m. and 10 a.m. Tuesday. An additional 1 to 3 inches of snow with light icing is expected here, before the changeover. With the wintry-wet transition underway, Tuesday morning's commute may very well be a messy ride. 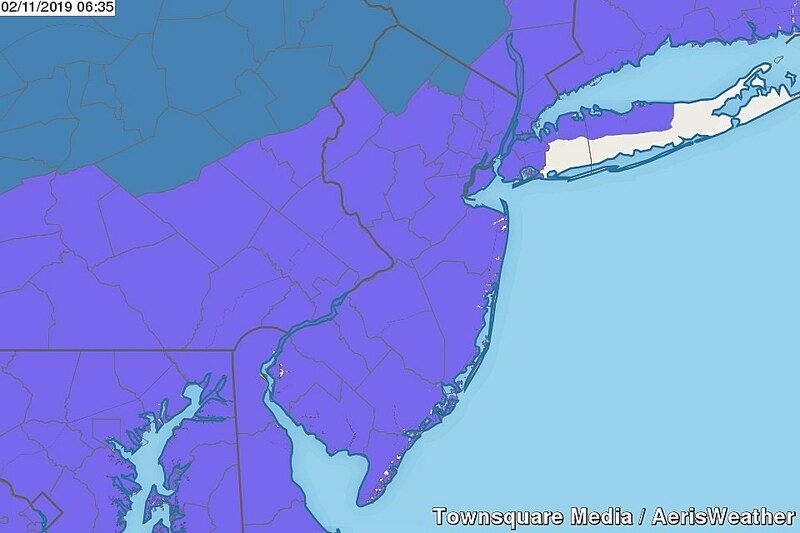 —Northern Mercer, northern Middlesex, Hunterdon, Somerset, southern Warren, southern Morris, Union, essex, Hudson, eastern Bergen, eastern Passaic... (Blue)... Quiet during the day Monday, but snow will return Monday night (probably after Midnight). And snow will continue to fall through Tuesday morning, intensifying from about 10 a.m. onward. The transition from snow to icy mix to rain will finally happen between 10 a.m. and 1 p.m. That's plenty of time for an additional of 3 to 6 inches of snow to accumulate. In addition, as the temperature rises past the freezing mark, an extended period of sleet and freezing rain could lead to a glaze of ice. The commutes for both Tuesday morning and Tuesday evening may be a messy ride. —Northern Warren, Sussex, northern Morris, western Passaic, western Bergen... (Green)... Good ol' North Jersey stays cold for the duration of this storm, so the most significant wintry impacts in the state will happen here. Quiet during the day Monday, but snow will return Monday night (probably after Midnight). Snow will continue to fall through Tuesday morning, intensifying from about 10 a.m. onward. 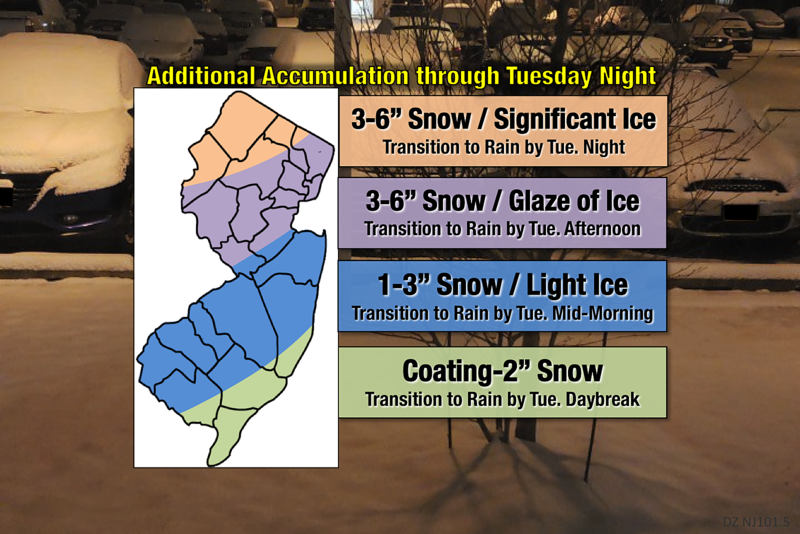 The transition from snow to icy mix may not happen until after 1 p.m. Tuesday — and I'm not entirely certain that this area of the state goes to all. I think my forecast of 3 to 6 inches of snow accumulation and up to a quarter-inch of ice is a safe bet. The commutes for Tuesday morning and Tuesday evening will almost certainly be a messy ride.